Electrical and magnetic properties interact to produce all data storage and logic computing functions known today. In order to engineer such behavior, it is necessary to understand it in depth, and this in turn is aided by the capability to observe the magnetic state of thin films or patterned nanoelements directly, using high resolution imaging. Asylum Research MFP-3D AFMs have an accessory named the Variable Field Module (VFM3) that is very useful in enabling the direct visualization of magnetic configurations at nanoscale, with the use of magnetic field microscopy (MFM), where the sample is subjected to applied magnetic fields either in-plane or out-of-plane. With MFM, which is the preferred tool for such research, a silicon tip coated with a magnetic film is employed in tapping mode. Once each line is measured topographically, it is scanned a second time but with the tip lifted above the topographical features already measured by an offset which is set at a constant value. The offset is typically in tens of nanometers, and lifts the tip above the surface features so that the long-range forces which are acting on the tip, can be quantified. Since the distance remains the same, the difference in the electrostatic and magnetic forces will cause variation in the cantilever oscillation. This application note describes two instances of the use of MFM with Asylum MFP-3D Infinity AFM equipped with VFM3 to assist with the creation of new materials. Figure 1. Schematic of the magnetic interactions between the magnetic AFM tip and a sample with magnetic domains. This deals with a methodical examination of films which show perpendicular magnetic anisotropy (PMA), that is, the perpendicular alignment of magnetic domains respective to the film’s plane. The film described here is a sputtered thin film with cobalt and nickel (Co/Ni). PMA is useful in allowing the use of a small bit size in hard drives2, as well as reduced power consumption for the next generation of STT-RAM.3 MFM is employed to examine how magnetic domain structures evolve in thin films for which PMA is a function of the applied magnetic field. This technology was restricted until now in its application because only custom-built AFMs were capable of applying perpendicular fields to the samples while examining them using MFM. The availability of the VFM3 module for use with the MFP-3D Infinity AFM allows the free measurement of these parameters while fields are applied out of plane up to ~±1500 Gauss. Figure 2 shows one example in which MFM is used to capture images from a sample of Co/Ni thin film which is subjected to an applied perpendicular magnetic field of about 210 Gauss. The color denotes the phase information gathered by MFM, corresponding to the magnetic texture, while the extreme smoothness of the film’s topography is shown by the 3D surface. The contrast seen here is because the magnetic domains have separating walls limiting the ferromagnetic domains. Figure 2. MFM phase data painted on the 3D topography of a sputtered cobalt/nickel multilayer film under a perpendicular magnetic field of -210 G, 10 μm scan. Previously, such experiments were cumbersome and time-consuming. Not only did the field require manual readjustment after each set of images was acquired, but the magnet systems built to order to apply magnetic fields out of plane to the sample during MFM used electromagnets. This meant that quite a bit of heat accumulated during their operation, leading to unacceptable drift during the AFM measurements. This required continuous compensation. In contrast, the use of the VFM3 module has made these measurements easier and more rapid, since, first of all, permanent magnets are employed for the applied field 4 which prevents Joule heating and so stabilizes the device considerably. The second advantage is the ability to directly control the field strength applied by the VFM3 using the Asylum Research MacroBuilder software. This is a simple tool based on graphical software, which can be used to create macros to make repetitive measurements during AFM. When these were combined, hundreds of MFM images were acquired automatically with a varying applied magnetic field. The script for the MacroBuilder is just one simple loop which contains increments to the magnetic field as long as the tip does not touch the sample surface, as Figure 3 shows. The tip is then brought into contact with the surface, and during this stage MFM images are acquired for both Amplitude and Phase. In this study, 190 images were captured in five hours. Between images the field strength underwent incrementation by 5 G. Figure 4 shows a subset of these images, which are important in that they yield direct data on the way the magnetic domains form as the applied magnetic field goes from a negative magnetic saturation to a positive one. When so many images have to be analyzed, the task may appear forbidding. The MacroBuilder can build automated offline image analysis functionality. As seen in Figure 4, each image had its 2D Fourier transform calculated using an automatic post-processing script. These transforms show that an ordered domain structure came into being before the magnetic field was zeroed. They also yield many details regarding the evolution of periodic and anisotropic domain structure as well as the formation of its period. Thresholding and masking are used to binarize the images automatically. This permits the formation of the area and the perimeter of the magnetic domains to be examined against the magnetic field. Figure 5 shows plots of the area and perimeter of the domains with respect to each of the 190 field strengths. This reveals a significant variation in the generation of these parameters. The VFM3 module from Asylum Research will thus help in studying how magnetic domains form in thin films when magnetic fields are applied to them. It is easy to use and shows enhanced productivity, which means reducing the time spent on data acquisition and increasing the time used to research the physical underpinnings of these magnetic materials. Figure 3. MacroBuilder scripts are simply created using drag-and-drop modules. Here, a single loop was set to repeat 190 times, collecting MFM images after incrementing the field strength by 5 G at each step. Figure 5. Built-in masking functions were used to automatically binarize each of the 190 MFM images and then calculate the corresponding area fraction occupied by the domains and their total domain perimeter. The graphs clearly show that the domain area (top) peaks near -100 G, while the perimeter length (bottom) reaches its maximum near 0 G. This information can be used to better quantify the shape evolution of the domains. Here, cobalt-based thin films with an asymmetric structure composed of multiple layers were designed. The films comprised cobalt sandwiched between two heavy metals. 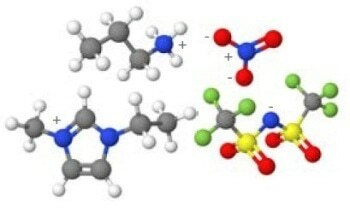 This was to ensure that additive chiral interaction occurred at the interface, which is critical in inducing such unique magnetic domains. This interfacial interaction is called Dzyaloshinskii-Moriya interaction and stabilizes the nanoscale magnetic skyrmions, which are chiral domains of a circular form, by tending to tilt spins in proximity to each other in one particular direction, as seen in Figure 6. Skyrmions are not magnetic bubbles, which depend on dipoles for their stability, and usually have diameters measuring a few hundred nanometers. Kerr microscopy, which uses magnetic optical methods, is used to acquire images of these bubbles with ease, while skyrmions can only be visualized using imaging tools with higher resolution. The finding of individual skyrmions in a stable state with dimensions below 100 nm at ambient temperature in a material suitable for such technology, was instrumental in sparking research into their applications in actual devices which could become a reality very soon. However, STXM can be carried out only in a synchrotron facility and thus the time available for such studies is restricted by the availability of such centers. This is another immense advantage of the Asylum VFM3 module, which could be a very useful alternative to the use of STXM in these experiments. 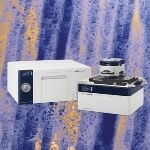 In fact, most STXM measurements and observations can be repeated as a routine and at high speed using various multilayer systems in Asylum laboratories, because of factors such as the sensitivity that the MFP-3D Infinity AFM offers to MFM performance, the out-of-plane magnetic field application and adjustment possible with the VFM3, and the availability of automation for this system. Figure 7 shows this achievement, which has allowed researchers to overcome the obstacles posed by the limited time they get at synchrotron facilities. Figure 7. Comparison of STXM (left) and MFM (right) images of out-of-plane magnetization in a Ir/Co/Pt multilayer film under an applied perpendicular field of 80 G. Scan size 5 μm. MFM images easily reproduce the same qualitative domain structure at higher resolution. A further advance towards using the skyrmions in data storage is to be able to understand how they behave at nanoscale. This has been initiated using pads limited using e-beam lithography with the diameters ranging from 400 nm to 1 micron. The early results acquired with these structures is shown in Figure 8, with STXM images being shown alongside, so that they can be compared with those obtained by MFM. It is obvious that as the pad diameter varies, the behavior of the magnetic domain also changes dramatically, when subjected to perpendicular magnetic fields, as researchers had already predicted using micromagnetic simulations. The restriction within a geometrical area in combination with the perpendicular magnetic field led to the capability of stabilizing single skyrmions in a suitable structure. Figure 8. MFM imaging reveals domain behavior as a function of pad diameter and applied perpendicular magnetic field. Each MFM image of nine pads (top and middle rows) was acquired in about 20 minutes each, compared to 60-90 minutes each for the STXM images at single pads, effectively increasing data throughput by 30-50X. Such instances are extremely apt to show the ease with which the use of MFM on the MFP-3D Infinity AFM along with the VFM3 module allows magnetic domains to be imaged at nanoscale. This is done under the influence of applied magnetic fields, while achieving a resolution hitherto only found with a synchrotron facility. Research in this area is bound to advance rapidly because of the removal of the limitations on time available at a synchrotron. In addition, the potential to automate the whole process from acquisition of images to data processing will lead to higher productivity. Hubert and R. Schäfer, Magnetic Domains: The Analysis of Magnetic Microstructures (Springer, 1998). A. Moser, K. Takano, D. T. Margulies, M. Albrecht, Y. Sonobe, Y. Ikeda, S. Sun, and E. E. Fullerton, J. Phys. D35, R157 (2002). S. Mangin, D. Ravelosona, J. A. Katine, M. J. Carey, B. D. Terris, E. E. Fullerton, Nat. Mat.5, 210-215 (2006). R. Proksch, E. Runge, P. K. Hansma, S. Foss and B. Walsh, J. Appl. Phys.78, 3303 (1995). S. Mühlbauer, B. Binz, F. Jonietz, C. Pfleiderer, A. Rosch, A. Neubauer, R. Georgii, and P. Böni. Science323, 915-919 (2009). A. Fert, V. Cros, and J. Sampaio. Nat. Nanotech. 8, 152-156 (2013). N. Nagaosa and Y. Tokura. Nat. Nanotech.8, 899-911 (2013).